When you hear the words “Central Finance” – what is your perception? How would you define it? Coming from the ASUG Annual Conference, and specifically from a pre-conferece workshop, a few misconceptions surfaced about what Central Finance is, and what it is not. So let’s talk about the terminology, and then take a look at the options of getting there. SAP S/4HANA Finance – the financial software that is a part of the SAP S/4HANA Enterprise Management solution, the next generation business suite. The functionality encompasses all capabilities of the Finance portfolio, including Financial Planning and Analysis; Accounting and Financial Close; Finance Operations; Treasury Management; Enterprise Risk and Compliance; and Cybersecurity and Data Protection. Central Finance – a deployment mode that allows organizations to move to SAP S/4HANA Finance by bringing together Finance information from multiple back-ends, whether they are SAP or non-SAP back-ends. That being said – from a systems perspective, Central Finance IS a SAP S/4HANA Finance system. It is simply a deployment mode of how SAP S/4HANA Finance is implemented in relation to other systems that may already be in place. 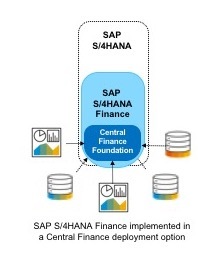 SAP S/4HANA for central finance foundation – the formal name for the deployment mode of Central Finance, which from a systems perspective, is specifically the tool within SAP S/4HANA Finance that allows organizations to map the data between their back-ends (SAP and non-SAP) and the instance of SAP S/4HANA Finance (Central Finance) that centralizes the information from those back-ends. Unlike the nineties, “big bang” implementations of any new systems and scenarios are becoming increasingly rare. And while there are several options of moving from multiple back-ends into one instance of SAP S/4HANA Finance, it is certainly not an “all or nothing” scenario. Keep in mind that with each option, you need to consider where your system of record lies for financial disclosures, meaning deciding where the information stored that is required for financial disclosures. Moving one ERP at a time to Central Finance. In this scenario, for a period-end close, the system of record remains in each source system until all ERP systems have been mapped to Central Finance. Moving one Finance process at a time to Central Finance. You may move just accounts receivable into Central Finance, or just asset accounting. Here again, for the period-end close, the system of record remains in the source systems until all processes relevant to the close are mapped to Central Finance. Moving one legal entity at a time. You can also move one legal entity or one business unit at a time into Central Finance. The same is true here of the period-end close, the system of record remains in the source systems until all legal entities relevant to the close are mapped to Central Finance. Moving all Finance processes in all back-end systems to Central Finance. While this is a “big bang” approach for Finance, it does not affect any of the operations and logistics processes that are still carried out in the various back-ends. In this scenario, Central Finance can become the system of record, which is especially valuable if there are consolidations processes and intercompany reconciliations that are carried out here. The biggest benefit of using the Central Finance deployment mode is that finance teams can leverage the benefits of SAP S/4HANA Finance, without disrupting the processes in the source ERP systems, and without needing to immediately convert each backend system to SAP S/4HANA. Once manufacturing and operations are ready, then can then move their processes into the Central Finance instance. Again, Central Finance is a full SAP S/4HANA system, in which only Finance capabilities have been implemented. The logistics processes can then also slowly move into the Central Finance instance, there is no need to re-implement; companies then simply begin to use the other capabilities of this SAP S/4HANA instance. I am not sure how one would implement Central Finance process by process. This would mean part of the data in a source system would be replicated to Central Finance which still woudnt be the system of record. I am not sure how one would set up this kind of partial replication from source system ?